For many visitors to Chiang Mai a trek through the forests to visit tribal villages is a memorable highlight. We will be happy to arrange such activities for you to ensure you have a safe and rewarding experience -- and with minimum impact on the environment and tribal culture. For most people, a three day trek is optimum, though shorter and longer trips are available. The walking can be quite strenuous, for while the hills are often not too high they are very steep and plentiful. However, we are careful to break up the walking with alternative transport such as rafting and elephant riding. Our guides are all experienced, registered with the local tourist authority, and many speak several of the tribal languages. They are all excellent cooks too, so you can be assured of a healthy feast after an action packed day! 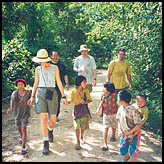 Trekking programs require a minimum of 2 persons (and we are also careful that there aren't too many in a group). Head out of town for the Sanpatong District. Take an elephant ride up to a Hmong village in the mountains, to experience traditional tribal lifestyles. Then walk back down the mountain for about 20 minutes to reach a spectacular waterfall where you can swim if you wish. Enjoy a picnic lunch in this tranquil setting. After lunch, we'll move on to a remote Karen village. From here we'll take a bamboo raft along a particularly beautiful stretch of river passing through dense forest, and then head back into town. Head North from Chiang Mai for the two hour picturesque journey to lunch at the Mog Fa waterfall. After lunch drive up into the mountains, stopping at a hot spring, where you can bathe in the mineral rich water. Walk for two hours to a Karen village, where the tribal people still lead a traditional life. Dinner and accommodation in the village. On the second day after breakfast, take a two hour elephant ride through the forests to the rafting camp, where lunch is provided. Afterwards, float down the Mae Tang river on a bamboo raft for two hours before taking a truck back to Chia ng Mai. On the second day, make the steep three hour trek through dense forest to another Karen village, where lunch will be served. Afterwards, a two hour elephant ride brings you to a traditional Lahu village, where you can eat, relax and spend the night. After breakfast, take a bamboo raft down the Mae Tang river to a Shan village for lunch. Explore the spectacular landscape before heading back to Chiang Mai by truck. Head to a picturesque area to ride an elephant through the jungle, then watch the elephants at work. Take a bamboo raft down a river before trying your hand at ox cart riding. Visit a Lisu or Hmong tribal village, and stop off at an orchid farm before heading back into town. Includes an excellent buffet lunch.